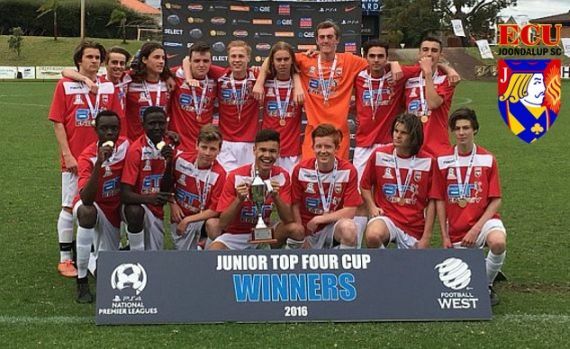 ECU Joondalup under 16’s became the third Jacks side to win the Top Four Cup after a hard fought 2-1 win against Subiaco AFC at the E&D Litis Stadium on Sunday afternoon. ECU took the lead from good link up play down the right side, the ball was slipped to Ben Meier who drove past two players into the area and finished well across the keeper. Subiaco pulled one back early in the second half after ECU failed to deal with a corner, but they were back in front from a corner of their own. A quality in-swinging corner from Zach Welch evaded all in the area to find the far corner of the net. The Jacks pressed for a third with Luke Salmon, George Lomax, Joe Bibby and Louie Robinson all going close. The last five minutes of the game Subiaco threw the proverbial kitchen sink, but the defence and keeper Owen Fisher stood resolute and closed out the game. Coach Howard Tweats said it was a great team performance. “It was a fitting end to the season for the group who from the last game of the regular season raised their application, embraced and adapted to a new game plan focused at making the play off final. Through their determination and execution went one further and actually came out winners,” he said. “The whole squad of 16 deserved praise for both performances in training and match days, and after two convincing victories before the final to add the performance they did in the final was commendable. Skipper Zachary Welch said after an in-different start the side gelled well. “Our season has been anything but easy. Our team started with several new players and like many other teams it took us time to become the team we are today,” he explained. “Obviously we had our ups and downs, but it was our downs where we were able to find focus points and improve on areas that needed fixing. It’s a great feeling to know we put in the countless hours in order to achieve what we did.